Choose between a Pottery or Glass Fusion party! 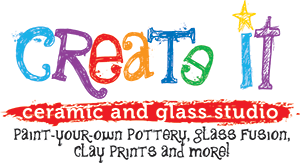 The party includes 1.5 hours of studio time and all of your supplies, kiln firing, and support by our trained staff. Both party packages accommodate for 10 artists. Creativity Party—$35 per additional artist. Deluxe Party—$45 per additional artist. Feel free to bring your own food, drinks, and decorations. Contact us if you have any questions. $50 non-refundable base party fee required. Additional party fee for parties larger than 10. A 15% gratuity will be added plus tax. Closed studio includes 2 hours of private studio time with either the Creativity Party or Deluxe Party. Contact us to help plan your private event. $100 non-refundable deposit. 15% gratuity will be added. Take the party to your destination! We provide everything your artists will need to create. Off site party includes 2 hours of time with either the Creativity Party or Deluxe Party package.